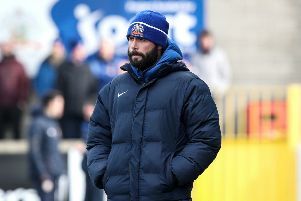 It was a case of déjà vu for Gary Hamilton and his Glenavon side when they took on Coleraine on Saturday. Yet again they had to make do with a share of the spoils despite creating a number of great opportunities at The Showgrounds. Incredibly it was the Lurgan Blues’ 13th draw of the season, but Hamilton hopes their luck will change with the arrival of striker Andrew Mitchell in the summer. “Yeah that’s another draw for us this season, that’s the reason why we are sitting where we are,” he said afterwards. “We’ve dominated a lot of games, but we haven’t been able to go on and get that winning goal. “If we had managed to turn those games into wins then we would have been up with the likes of Coleraine, and probably been in the final of another Irish Cup. “We haven’t been able to find a solution to that, and today was another example of our problem. “Between bad misses, a couple of great saves from their keeper and a couple of good blocks from their defenders, that’s been the difference between us winning and drawing today. “We are delighted with the performance and the attitude of the boys again. The visitors had the better of the opening exchanges with Chris Johns being forced into action by James Gray and Rhys Marshall. They should have broken the deadlock before the hour mark when Mark Patton was put through on goal, but he lost his composure and blazed over. They were made to pay for their profligacy in front of goal when substitute Darren McCauley volleyed in Ian Parkhill’s cross with 20 minutes to go. They should have killed off the game but wasted several great opportunities including a four on one break. The visitors pushed on again in the closing stages and drew level with a minute to go as James Singleton headed in Gray’s centre. And they almost snatched all three pointswith the last kick of the game as Marshall’s snap shot looked destined for th enet but for a world class save from Johns. “It was a bit frustrating we didn’t kill the game off,” said Coleraine boss Oran Kearney. “We had a great opportunity to do that when we had four on one, but we were reckless in the way we went about it. We had a couple of other chances too were if we had been ruthless we could have put the game to bed. “At 1-0 it always gives the opposition the chance to get back into it. Coleraine suffered another blow as talented young midfielder Brad Lyons was stretchered off with only 14 minutes on the clock. It looked bad for the player, but those initial fears were allayed somewhat as he walked out of the changing rooms at the end. “I can’t say too much about Brad at the minute as it’s still early on,” said Kearney. “As he blocked the ball he felt a shudder go up his leg, with everything that’s coming ahead of him there was probably a bit of a fear factor more than anything else. “We didn’t want to take any risks either.